Compared to this whole world of blinky electronic sound devices like Digitakt, Eurorack Modules and all this interesting stuff from small companies and makers, the electric guitar market looks a little bit boring. I play guitar but I also like those new ways of making music and I believe that a guitar could integrate great into an electronic music setup. It just needs a redesign. After thinking a lot about building a guitar from scratch and thereby be able to impelement my ideas the way I like – I finally know how to approach this endevor. So here is my proposal for an open, modular guitar design with room for nifty features (like seqencing the string-volumes) to make modern music. I have spent much time in the past to hack guitars, adding robotic elements to them, messing with control interfaces and audio effects. But I allways did this in a non-destructive way, as I didn’t wanted to do something to my babys I couldn’t redo. One thing I always wanted to have, but never really achieved on this premise was an illuminated fretboard to display all kinds of information, like scales and sequencers. This problem is the main driver of the project and most of my thinking about building this guitar was how to do this. 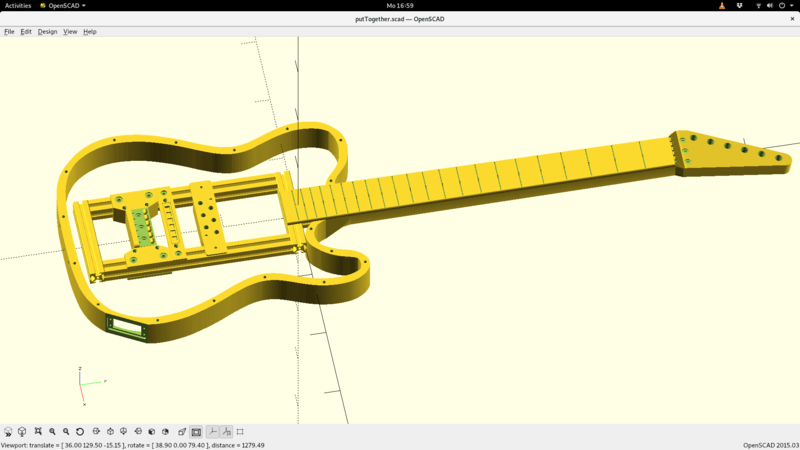 As I’m not a carpenter but more an allround maker with typical maker tools like a 3d-printer and a cnc-router, the main challenge was to commit to a concept of building this guitar with those tools I have. Here are some specs and design goals I have/had in mind when building the ElekroCaster. This list will evolve. Two micros, one for audio an one for everything else. Here are two video showing the led-fretboad in action. The first one shows the sequencer which I program using the touch-sensing frets. It works not perfect yet, but I think i can improve on that. Notice that the strings are muted and do only sound when the string touches a fret and the sequencer hits an activated step. The strings are hit with this blue device next to the pickup which basically consists of 6 solenoids. I call it kickup:) More about that on my next project log.